To WIN all these goodies, head to Instagram, follow @sbond, tag two friends and comment on how you would most like to spend Mother's Day (with your Mother, someone else's Mother, or as a Mother). 1. The Bondville Mother's Day Giveaway 2016 is a game of skill. Entry via Instagram with a comment on how you would most like to spend Mother's Day. 3. Entrants must follow on @sbond on Instagram and tag two friends. 4. The winner of the giveaway will be chosen by Steph Bond-Hutkin based on the most interesting comment. 5. This giveaway is open to all Instagram account holders in Australia. 7. 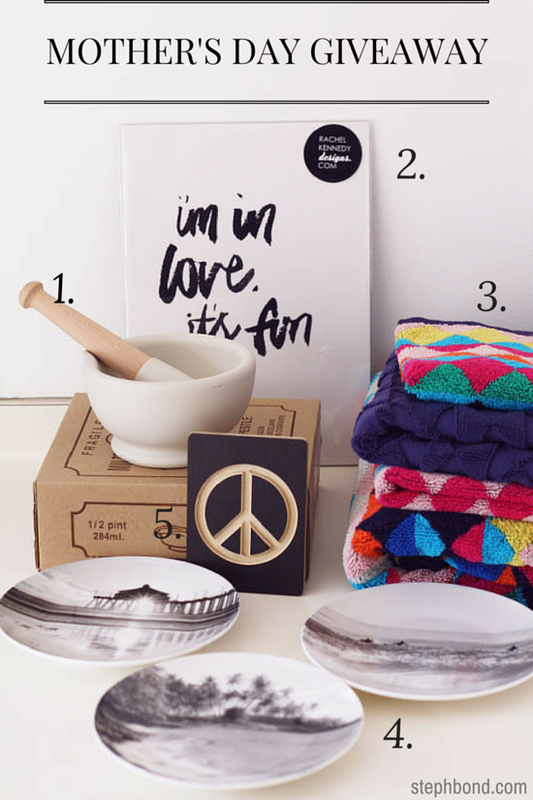 The prize consists of a mortar and pestle, art print, timber plaque, side plates, bath towel, hand towel, face washer and bath mat valued collectively at $200. 8. The giveaway opens on Thursday 5th May and closes 5pm on Sunday 8th May 2016. 9. The giveaway winner will be announced on Bondville on Sunday 8th May 2015 and notified by Instagram messenger and/or email (if provided). If no reply by midnight 9th December, a runner-up will be chosen to receive the prize. 10. This promotion is in no way sponsored, endorsed, administered by, or associated with Instagram.